Bernie Silent About Private Jets! Another “Do as I say, not as I do” scam merchant! Vermont Sen. Bernie Sanders, who might run for president in 2020, called climate change our “biggest crisis of all” in a response to President Donald Trump’s border wall speech Tuesday night. 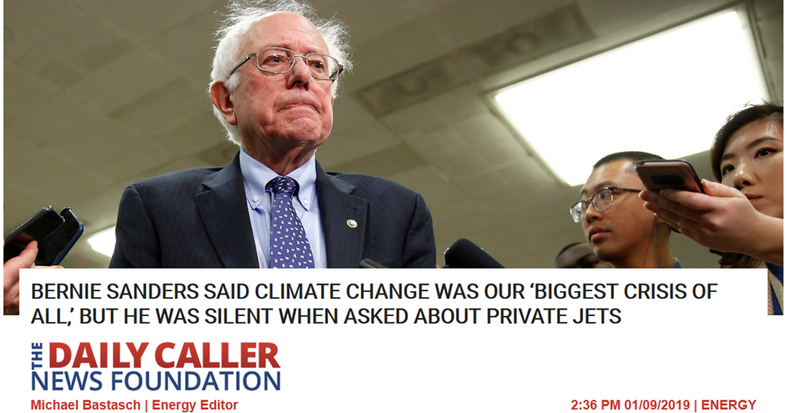 However, Sanders did not respond to The Daily Caller News Foundation’s simple question — if climate change is such an urgent threat, would you endorse a ban on private jets? Sanders, known as a “climate hawk,” has made fighting global warming a central part of his 2016 presidential bid and thrown his weight behind “Green New Deal” legislation championed by Democratic New York Rep. Alexandria Ocasio-Cortez. It might be because Sanders has extensively used private jets for travel while campaigning. For example, The Guardian reported in 2016 Sanders flew a Boeing 737 private jet “out of Des Moines on the night of the Iowa caucus” during the Democratic primary. More recently, Sanders’s campaign came under fire for spending nearly $300,000 on private jet travel in October 2018 as part of a “9-day, 9-state tour to support Democratic candidates up and down the ballot ahead of Election Day,” a campaign spokeswoman. Traveling by air is much more carbon-intensive than driving, and flying private results in much more emissions per person than flying commercial. Environmentalists have increasingly focused their campaigning on reducing airline emissions. ← Terence Corcoran: Who Will Replace Obama’s Man At The World Bank?